Determine the total cost. The first thing to consider is the operating cost. This amount, along with the actual purchase price, should give you the real cost of the appliance. Check the energy rating. There are several reliable rating services that provide information about appliance energy consumption. 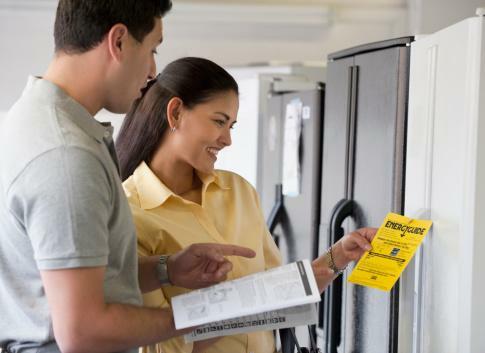 The federal government uses the Energy Star Standard sticker to inform consumers of the operating cost and the annual energy consumption of each appliance. Select the right size appliance. Running a large machine – even the most energy-efficient one – uses more electricity than a compact one. Look for economy choices. Many dishwashers and washing machines offer a variety of different cycles. If you find one with an economy cycle, you’ll save money when you only need to wash a small load of clothes or dishes. Stay Simple. When it comes to choosing a refrigerator, go easy on the add-ons. Top-to-bottom fridge/freezer models are more energy efficient than side-by-sides. Features like water dispensers, ice-makers and auto-defrost use lots of extra electricity. This holds true for self-cleaning ovens, too. Contact your utility supplier for the latest ways to save on utility charges. With today’s smart devices, appliances can be programed to use less energy at certain times of the day. Check out your home. Hire a home assessor to identify ways you can save on your overall energy and water costs. Comparison shop. Never buy the first model you see. Household appliances are not cheap, and to find the most energy-efficient one at the best price, you’ll need to comparison shop. Don’t pay for the name in a specific model; compare the details of each machine.